How Much Did Blackwell Get? What Did Glenda Blackwell Do with Her Prize? Glenda Blackwell, a 57-year-old resident of Leicester, North Carolina, only wanted to steer her husband away from the lottery. Fed up with all the money her husband was wasting on lottery tickets, she bought a scratch-off ticket to prove her point. “I was going to be ugly and buy a scratch-off to show him they didn’t hit,” Blackwell said in an interview with WLOS News. Her husband, Buddy, had asked her to buy two Powerball tickets. She got a $10 Carolina Millions ticket instead. As it turned out, she was the one with a lesson to learn: The scratch-off ticket hit the game’s $1 million prize. 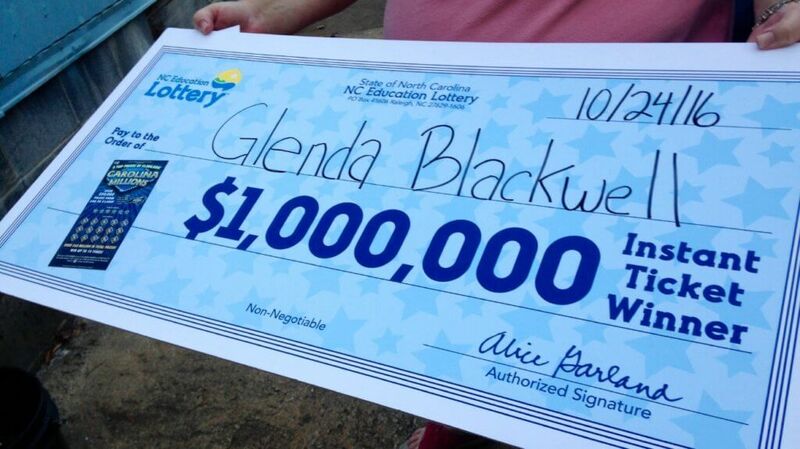 How Much Did Blackwell Get From the NC Lottery? Blackwell took home a total of $415,503 after taxes. As with most lottery winners, she had the option to get her prize money as a lump sum or in yearly installments. Blackwell, taking her health issues into consideration, chose to get her money as a lump sum payment. By the Monday after her win, Blackwell had claimed her check from the North Carolina Education Lottery in Raleigh. In keeping with state law, Blackwell’s name, city or town, and prize amount are available to the public. To protect her privacy, Blackwell chose not to pose for photos following her win. Blackwell used the money to buy land and a home. She also set aside part of the prize money to help out her daughter and add to her two granddaughters’ college funds. The scratch-off win came as a big relief to the Blackwells, who said that this was the first time money was no longer an issue for them. “We’ve struggled a lot, so now we can buy our own home and our own land. It’ll be paid for and I don’t have to worry about that no more,” Blackwell told WLOS.